With Valentines day fast approaching I wanted to make some kind of Valentines day craft with my niece. Back in the day that I was a waitress I used to decorate my pens for the holidays. You see, customers have a tendency to take the pens they sign the credit card slip with. I solved that problem by giving them a "fancy" pen. There was no way they were going to 'accidentally' take the pen with the leprechaun or Jack-o-lantern on it! 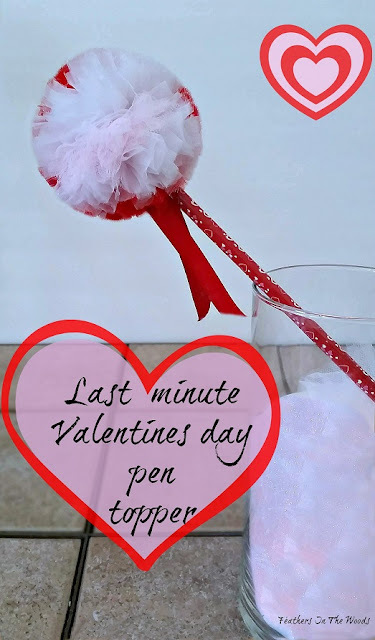 Of course I dressed up me pens for Valentines day too! I decided to make a pen (or pencil) topper. This one is really simple. You need some tulle, ribbon, cardboard and hot glue. The best part is that it only takes a few minutes. Because my computer is sorta down right now, I decided to do this craft on video from my phone. This is my first time doing a video tutorial, so let me know how bad it is! Cardboard, marker, scissors and X-acto knife to make your template. Tulle and ribbon in your chosen colors for your pompom. Pretty pencil and a hot glue gun. I will show you in the video how to cut 2 circles of cardboard into a template. You'll wrap the tulle around the cardboard template until you can't fit any more. You will cut along the edge of the tulle circle then remove the cardboard pieces. Tie with a ribbon to secure then hot glue the pencil in place. (in the video I forgot to remove the eraser first! Removing the eraser makes the glue hold much better since it has that space to fill up. I went out of frame also..sorry!) Then trim the uneven pieces of tulle. All done! It takes less then 10 minutes and is a super cute. Have fun making the pencil topper and Happy Valentines day!